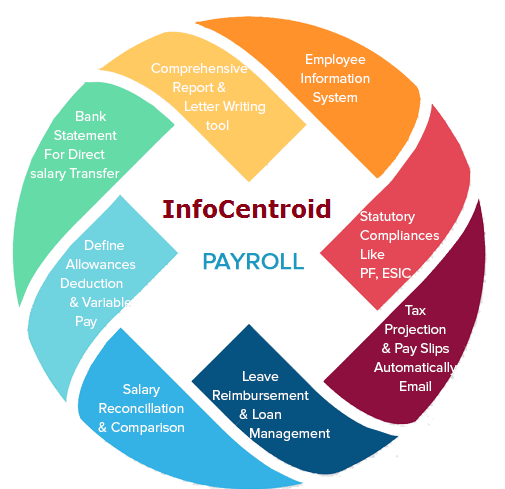 InfoCentroid payroll is exceptionally straightforward, adaptable and easy to understand Payroll Management programming that deals with every one of your necessities identifying with representative’s data and pay estimation alongside consistence. InfoCentroid finance catches finish records of the representatives, tracks Leave adjusts, processes Payout and pay compromise and produces all Statutory and MIS reports. You may set up rules for each allowance and deduction whether they affect arrears or not. Bank Statement for direct salary transfer to individual employee bank account. Tax Projection with expected TDS to be deducted from the current month’s salary. Generation of From 16/16 AA, From 12-BA, From 24Q eTDS, From 27A and ITNS 281 challan of Income Tax. Provision to define multiple letter templates to ease the communication with employees.